I had a couple of oranges sitting in my refrigerator waiting to be used, they were to the point that I thought that they would only be good to use for a baking project. 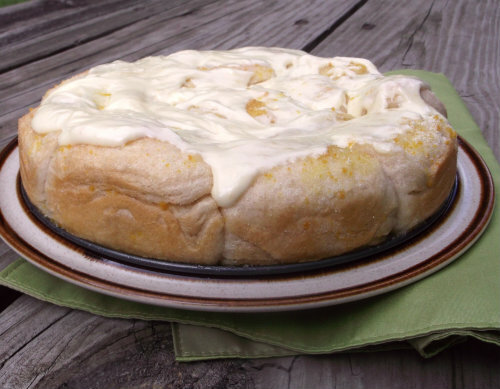 Knowing that Mike loves sweet breads made with orange flavoring, I started looking for a recipe for a coffee cake. I wanted to make it for Sunday morning so I was looking for something that would be fast to make. The recipe I found could not have been much simpler to make. It uses a can of refrigerator biscuits, along with butter, sugar, and of course my oranges that were sitting in the fridge. 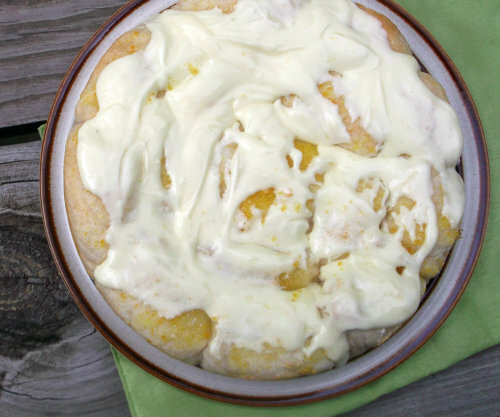 Normally I would not choose a recipe with biscuits that were purchased at the store, I would prefer to make my own dough, but this sounded pretty yummy. We loved the orange flavor of the coffee cake and the orange cream cheese frosting really complimented the coffee cake nicely. The recipe is supposed to be baked in a 9-inch cake pan which I didn’t have, so a 9-inch springform pan was used and I covered the bottom of it with aluminum foil just in case of leakage. I would change one thing the next time, I would bake the recipe for about 5 more minutes than what it called for, the coffee cake was just a tad under baked. But with that said I know that I would bake it again, it is nice to have something that takes so little effort. Also I want to thank Michele over at Follow Me Home for the award that she nominated me for. I hope you will visit her blog; she is one of the sweetest bloggers around and has the funniest sense of humor. I love her blog and I am sure you will love it as much as I do. Thanks, Michele!! Separate the biscuit dough into 8 biscuits. Place 1 biscuit in the center of the pan. Cut the remaining biscuits in half, forming 14 half – circles. Arranged the pieces around the center biscuit with the cut sides facing the same direction. Brush melted butter over the tops of the biscuits. In a small bowl, combine the granulated sugar and orange zest. Mix well and sprinkle over biscuits. Bake for 20 to 27 minutes or until golden brown. (Make sure they are golden brown or they may be a little doughy in the center). 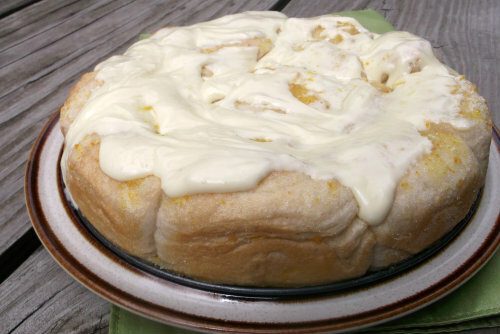 Meanwhile, in a small bowl combine confectioner’s sugar, cream cheese, and orange juice. Blend until smooth adding more orange juice, if needed, to thin. Drizzle glaze over the warm coffee cake and serve. You got me with ‘cream cheese frosting.’ YUM. And orange is my favorite, next to lemon. 🙂 Sounds delicious! Any and all Coffee Cakes are my friends, but when you come up with a recipe that’s that easy, I’m in! And Congratulations on your well deserved award. I love Michele and she obviously has great taste in blogs! Congratulations on the award, Dawn! This cake looks so delicious, oranges suit well to a coffee cake. I have not heard of refrigerated biscuits before – I’ll google and see, what I find ~ maybe one can use just ordinary shortbread biscuits. I love coffee cake! Never had one made from oranges though – sounds like an excellent idea. Really good stuff – thanks so much. I like our glaze and that the cake is a coffee flavor and that it’s easy to make. I wish I had a slice right now. It looks delicious.